First combat-ready modification of the P-38 Lightning. Used in Europe, North Africa, and the Pacific Theater. A total of 527 aircraft were produced. This is the first researchable American heavy fighter. It is very different from the other tier 5 heavies, sporting high speed and maneuverability over health and guns. This play style is very different from most American aircraft. When fighting the P-38 Lightning, use your maneuverability to get behind them and your speed to outrun them if they get too close for comfort. 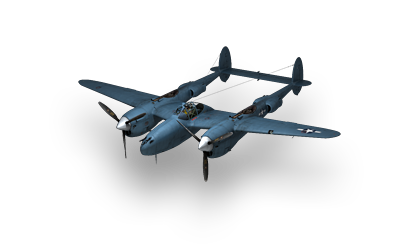 The P-38F is armed with 4 .50MG's and starts with a 20mm cannon but can be upgraded to a 37mm cannon. Having no tail gunner and low health are it's downfalls. This means that if a fighter with lots of guns like the Spitfire or BF 109 gets on your tail, they'll tear you apart. You may be able to outrun them, but their guns will get you first. For external weapons, the 4.5" M8 rockets or 500lb bombs are available for you to use. The rockets can be used in head-ons, but the bombs are better for ground targets. So it's your pick. Overall a fun fighter to play. It leads to the upgraded P-38J. This page was last modified on 27 March 2018, at 19:41.